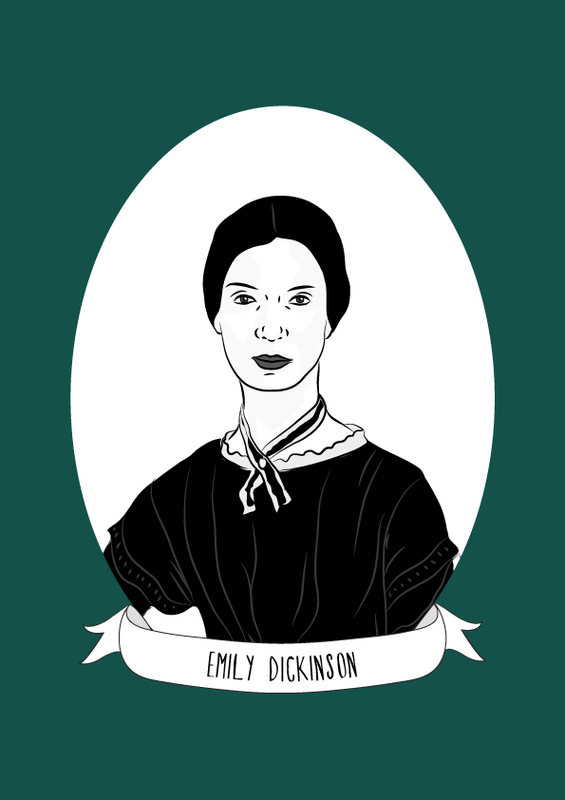 Emily Dickinson was a prolific American poet who has been posthumously celebrated for her unusual use of form and syntax. Dickinson was born in 1830 in Amherst, Massachusetts. Her father wanted all of his children to be well-educated and Dickinson attended primary school in Amherst before continuing on to Amherst Academy which had recently opened its doors to female students. Dickinson took classes in English, classical literature, Latin, botany, geology, history, mental philosophy and arithmetic. She was described as “an excellent scholar, of exemplary deportment, faithful in all school duties.” Dickinson then briefly attended Mary Lyon’s Mount Holyoke Female Seminary (which later became Mount Holyoke College) in South Hadley but lasted only ten months there before returning home. Dickinson had begun writing as a teenager, and in 1852, her poem entitled “Sic transit gloria mundi” was published anonymously as “A Valentine” in The Springfield Daily Republican. Two years later, she travelled to Philadelphia, Pennsylvania where she befriended minister Charles Wadsworth who would become her correspondent until his death in 1882. In 1856, Dickinson’s close childhood friend Susan Gilbert married her brother, William and the couple settled at the Dickinson Homestead in Amherst. Gilbert was supportive of Dickinson’s work, and was her ”most beloved friend, influence, muse, and adviser.” Dickinson’s mother became bedridden in the mid-1850’s and she became her primary caregiver, “finding the life with her books and nature so congenial, continued to live it”. She began creating manuscript books containing clean copies of her work, and the forty fascicles she created from 1858 through 1865 eventually held nearly eight hundred poems. None of these would be seen until after her death. During the first half of the 1860’s, Dickinson had withdrawn from social life and committed herself to her writing. She entered into correspondence with Thomas Wentworth Higginson, a literary critic, radical abolitionist, and ex-minister whose literary advice she valued and who provided her with moral support. Dickinson would write to Higginson that he had saved her life in 1862. In 1864, five of Dickinson’s poems were published in newspapers, including the Drum Beat, the Brooklyn Daily Union and the Round Table. In the late 1860’s, Dickinson began to become known as a recluse and gained the name “the woman in white” as she frequently wore a white dress. Although she would not speak to others face to face, she maintained her correspondence with others through letters and poems. Dickinson was better known during her lifetime as a gardener than a poet. She had studied botany from the age and 9 and had assembled a collection of pressed plants in a leather-bound herbarium with contained 424 pressed flowers specimens that she had collected and classified. Dickinson died in 1886, and was laid to rest in her family plot at West Cemetery. The Homestead is now a museum. Following Dickinson’s death, her sister Lavinia discovered a collection of around 1,800 unpublished poems, a collection of which were published in 1890, followed by a full complication, entitled The Poems of Emily Dickinson in 1955. Dickinson became known posthumously for strength of her literary voice and her unusual use of form and syntax including her extensive use of dashes, unconventional capitalisation, short lines, no titles, and often use slant rhyme. Her poems often dealt with her fascination with flowers and gardens and her “early and lifelong fascination” with illness, dying and death. During the second wave of feminism Dickinson became known as “the greatest woman poet in the English language” and for the first time was celebrated for both her contribution to poetry and the fact that she was a woman. She has inspired a number of feminist artists, including the feminist artwork The Dinner Party, by Judy Chicago. Dickinson is known considered a powerful and persistent figure in American culture, she is taught in American literature and poetry classes in the US and her herbarium is now held in the Houghton Library at Harvard University. Since 1890, Dickinson’s work has remained continuously in print.